Giffords Group's Radio Ads Hit McConnell, Ayotte On Gun Vote : It's All Politics A pro-gun control superPAC started by former Rep. Gabrielle Giffords and her husband, onetime astronaut Mark Kelly, launched radio ads against Republican Sens. Mitch McConnell and Kelly Ayotte for voting against bipartisan background check legislation. 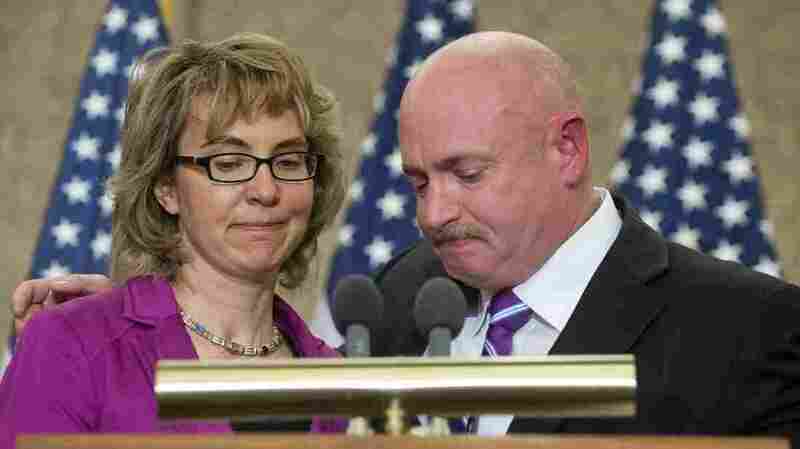 Former Arizona Rep. Gabrielle Giffords and her husband, Mark Kelly, at an April 16 ceremony naming a Capitol Hill conference room for her aide Gabe Zimmerman. Zimmerman died in the same Tucson, Ariz., shootings that Giffords wounded. On Wednesday, Americans for Responsible Solutions made good on that pledge by launching radio ads against two Republican senators: Mitch McConnell of Kentucky, the Senate minority leader; and New Hampshire's Kelly Ayotte, who is in her first term. "We watched. We listened. We felt it. Newtown. But Sen. McConnell won't listen to us." The anti-Ayotte ad has two female actors talking in a noisy coffee shop. FIRST WOMAN: "Remember that ad Kelly Ayotte ran saying she's one of us?" SECOND WOMAN: "Oh, where she's out for a run?" FIRST WOMAN: "Yeah. ... Well, it sure didn't take long for her to 'go Washington.' ... Ayotte voted against improving background checks to keep guns out of the hands of criminals." SECOND WOMAN: "Are you serious? Eighty-nine percent of the people in New Hampshire support universal background checks. She just ignored us?" The Giffords superPAC said the Kentucky ads are running in Louisville and Lexington, and the New Hampshire ads are running in Concord, Manchester and Keene. "As Gabby said last week, if we can't keep our communities safer with the Congress we have, we will work to change Congress," Americans for Responsible Solutions Executive Director Pia Carusone said in a statement. McConnell is up for re-election in 2014. Ayotte doesn't face voters again until 2016. McConnell campaign manager Jesse Benton said: "Sen. McConnell commends Gabby Giffords for her courage and perseverance but in Kentucky we have a fundamental disagreement with a gun control agenda. President Obama's allies have been attacking Mitch on this issue for months but his support for Kentuckians' Second Amendment rights will not waver." While four Democratic senators also voted against the measure, it didn't go unnoticed that they were spared the group's negative ads, at least for now. And two of the four — Mark Begich of Alaska and Mark Pryor of Arkansas — face re-election next year. Max Baucus of Montana announced on Tuesday that he would not seek a seventh term in 2014. The fourth Democratic no vote was newly elected Heidi Heitkamp of North Dakota. "We're thanking Democrats and Republicans. A solution supported by 90 percent of Americans isn't a partisan issue. We're going to support those who listened to their constituents and make sure that we educate those voters whose elected representatives ignored them."